Use PIM for Routine Property Inspections, Tenant Inspections, Ingoing/Entry, Outgoing/Exit and Move In/Move Out Property Condition Reports. PIM includes reports and workflows for offices, retail, hospitality and industrial. Talk to us about setting up your commercial PIM solution. PIM can be customised to support your community housing reporting needs. We also support data sharing with Chintaro. With extensive knowledge of the property industry & inspection requirements we can advise on workflow & reporting improvements for other industries & applications such as Short-Term, Strata and Body Corporate, Building, Site & Dilapidation Inspections. Why choose PIM for your Property Inspections ? 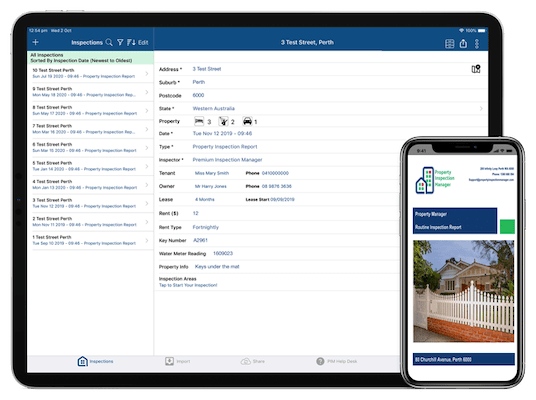 PIM is packed with features to make your inspection reporting easier & will very quickly help you save time & money & help you show how good you are at managing your Landlord's property. Designed specifically for iPad and iPad Mini, PIM allows you to enter inspection notes, take photos on your iPad and create professional PDF & MS Word reports easily. 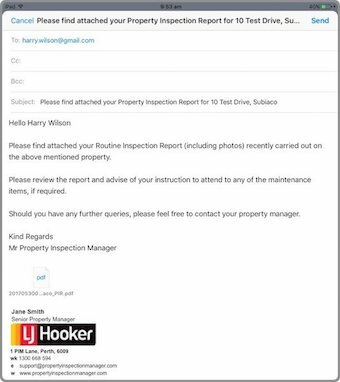 Edit and resubmit your inspections anytime/anywhere and send to owners/tenants directly from your iPad. 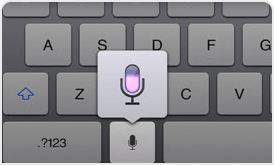 On screen checklists, customised shorthand words and voice dictation for fast comments capture. Format comments and photos quickly into your reports. Search previous inspections by address. Reuse previous inspections. The PIM team helps you solves issues quickly plus the PIM Online HelpDesk includes an extensive range of self paced How-To Guides and Training Videos to help you and your team get more out of PIM. Impress owners. Easily highlight maintenance actions. Easy for Tenants to follow. how PIM can generate professional looking reports to suit your business and your industry. Available for iPad and iPad Mini in the iPad App Store. Compatible with leading property management systems. Importing your Inspections into PIM has never been easier. PIM allows you to easily transfer your property data from leading property management software saving you time keying in your data and let you focus on performing your Inspections. 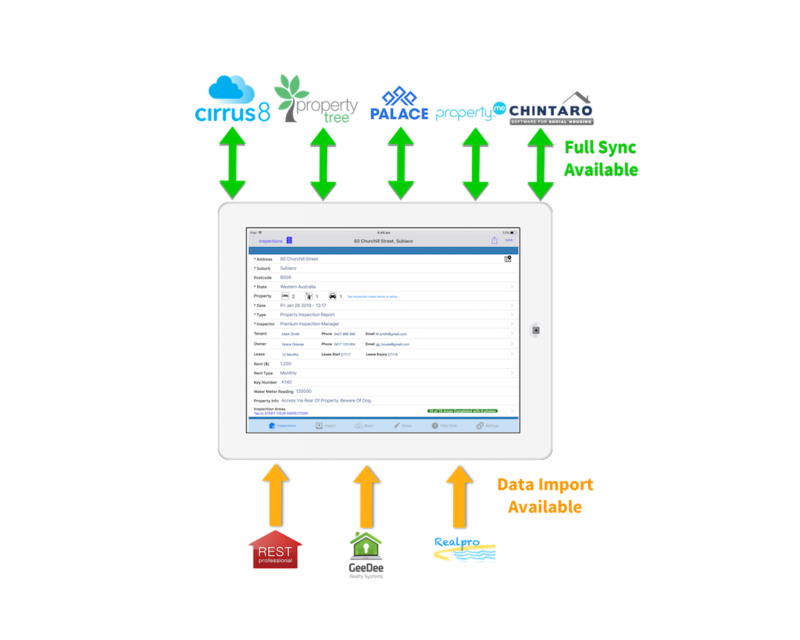 PIM fully syncs & integrates with Property Tree, Cirrus8, Palace and Chintaro with data sharing options available for REST, GeeDee, Console, RealPro and PropertyMe users. Contact us for more information or custom inspection importing solutions. Full PropertyMe integration coming early 2019. 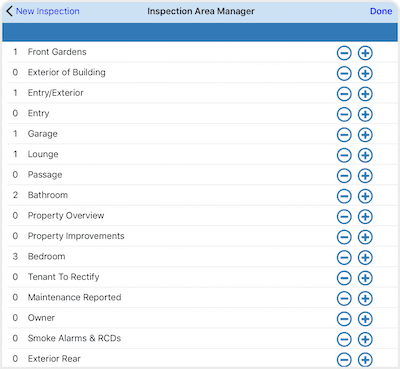 Easily add new Inspection Areas and Sub Inspection Areas in PIM to suit the layout of properties you inspect. Property Profiles make setting up all your Inspection Areas even easier. Customisable Shorthand Words allows you to create a library of terms and phrases you use frequently, saving you time capturing comments during inspections. Reduce typing by inserting comments in a couple of taps. 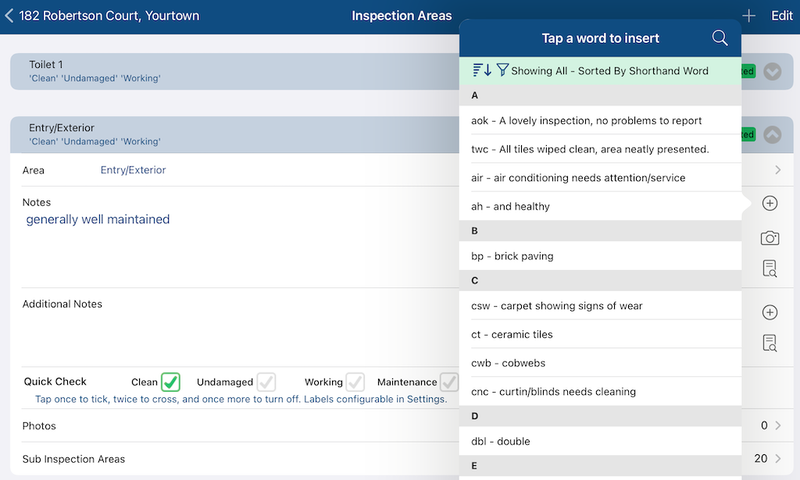 Filter Shorthand Words by Inspection Areas giving greater context and boost your efficiency. Why type when you can talk? If you have an active Internet connection Siri can convert your speech to text directly into PIM inspection notes. 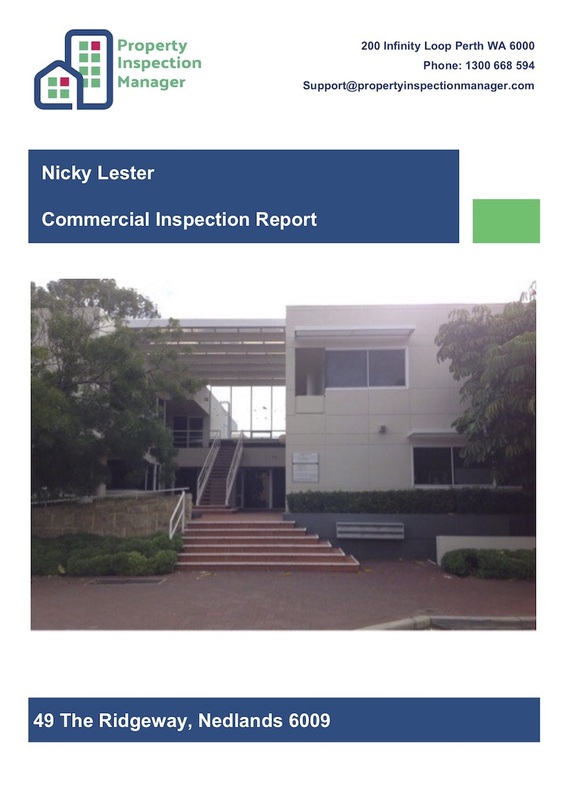 We develop report templates to suit the way you want to present your inspections results. 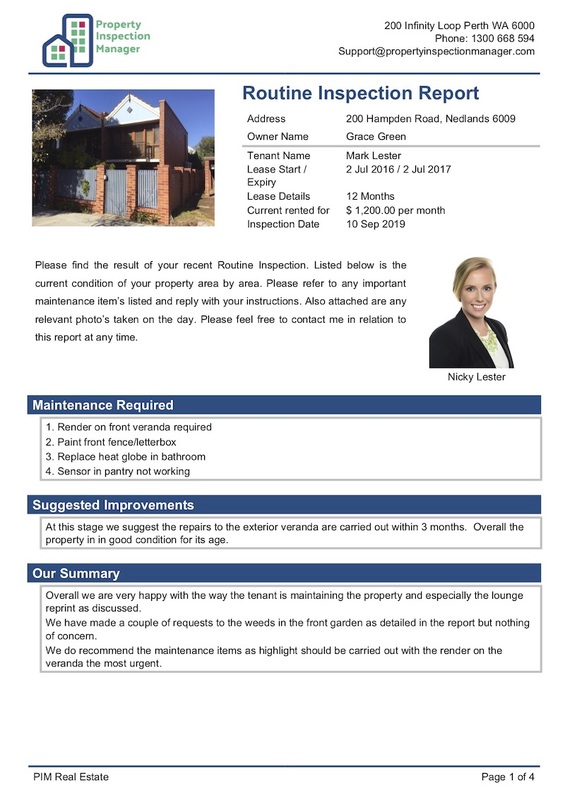 You can incorporate a cover sheet, a cover photo of the property, a staff photo, highlight important information in call-out boxes such as; “Maintenance Required”, “Suggested Improvements”, “Our Summary” and include your office logos and disclaimers. 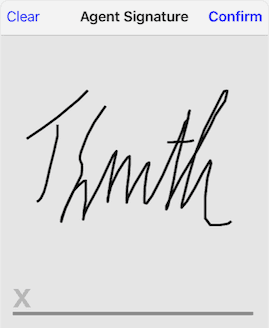 No other app gives you this amount of flexibility. Safety is a real concern when alone at a property so we have introduced ICE - (In Case Of Emergency). Locked out, injured, or just not feeling safe? 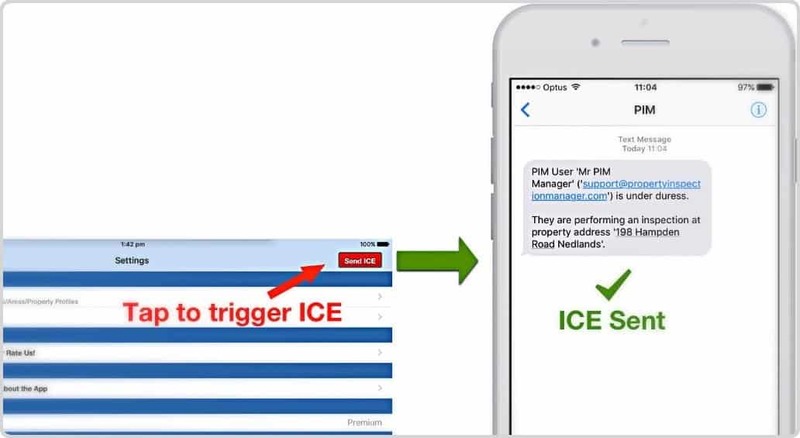 Hitting the ICE button can get help fast by sending an email and text with your GPS location to your designated contact person. 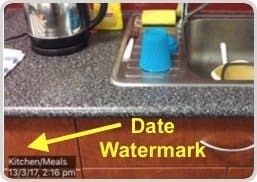 Leave no doubt in tribunal about when your photos were taken with this great embedded text feature. (Available for PIM Premium Users only). 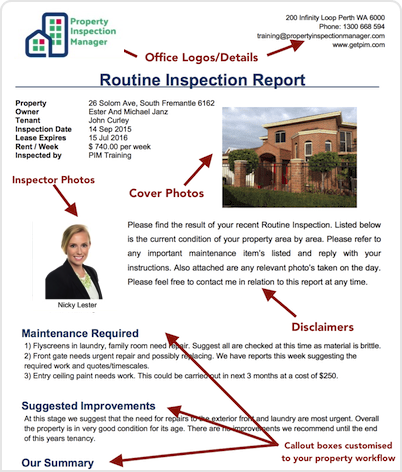 We know property managers like entering lots of inspection notes for your Inspections, and that's why we have made it even easier to pre-populate your Inspections. Every time a new Inspection is created your areas can be pre-populated with your notes, saving you heaps of time!. We know that not every office is not the same so PIM allows property managers to set up specific email templates for Owners, Tenants or yourself. Now you can use your personally branded email templates, using your terminology, even incorporating your branding for efficient and professional communication. 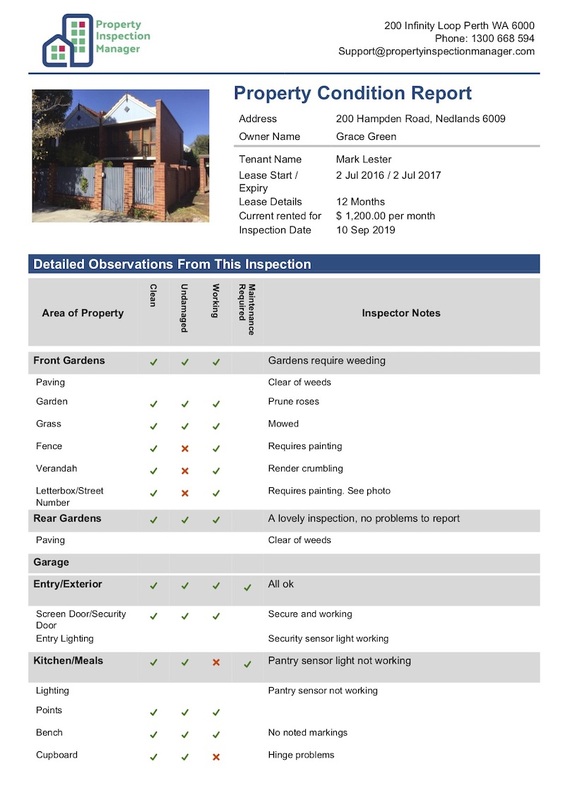 Exclusive to Property Inspection Manager, a separate courtesy "Tenant Inspection Report" can be created after the inspection been conducted that can just be sent to the tenant. This "Tenant Inspection Report" can be a simple ‘thank you’ or can include any items that need to be addressed. You can include photos that won’t be seen by the Landlord as well! Using a Tenant Inspection report is an ideal way to improve your communication to tenants in a simple efficient way. 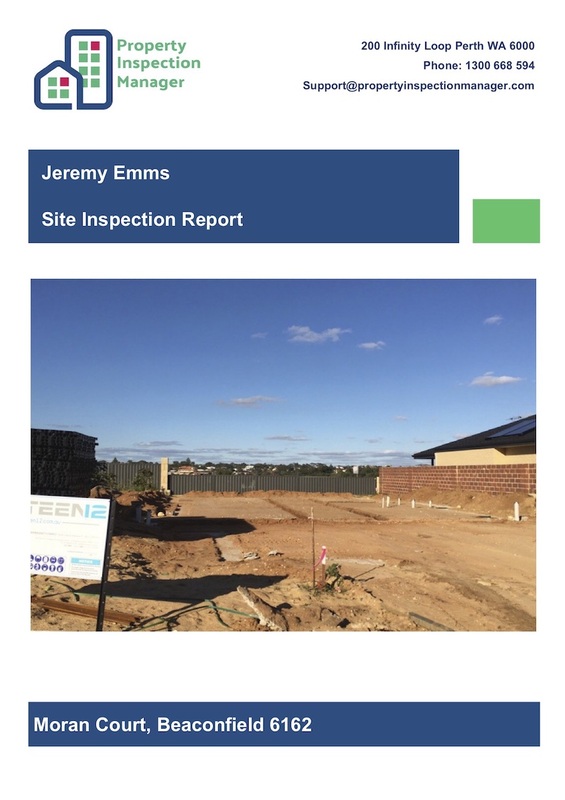 "I would like to take this opportunity to thank Jeremy and Phil for the assistance and professionalism that you have shown during the course of setting up the Property Inspection Manager app for our company. The ease in commencing with this process has been highly commendable and, in this often time poor industry, we have found your support and management of the program to be invaluable, precise and of the highest standard." Offering greater flexibility, integrates with all leading property management systems, is simple to use and offers professionally styled reports unique to your office and branding. Find out what our award winning customers are saying about PIM - The Inspection App for Professional Property Managers. "We have been using Property Inspection Manager as all of the reports are fully customisable to our requirements and the on-going support is fantastic." "Been using PIM for over 3 years, great time saving app that produces professional reports. no problem syncing or getting completed reports out. Really like the ability to customise the reports to how we want them and to customise to keep us with changes in legislation. The support team are great and listen and implement changes based on user feedback. Highly recommended." "Apart from the great support, the PIM team has responded to our concerns by being easy to use, cost effective and the transition was seamless which was important to us. The customised report looks much smarter than others I have seen and owners have commented on how professional the reports come across, PIM has been a great addition to our team." We cater for all property managers' needs and budgets. PIM Pro Plus and PIM Premium licensing is per device per annum. Try PIM for Free but with a few restrictions. Our flagship product to help you transform your inspections and reports. Includes a free no obligation 2 week trial. A cut down version of PIM Premium with customised reports. Pricing does not include cost of iPads themselves. For Australian clients, the price includes Goods and Services Tax (GST). **Further discounts may apply for multi-device residential PIM Premium licenses. Setup fees may be charged for templates that require advanced customisation, any customised settings or where multiple report templates are required (such as outsourcing companies). 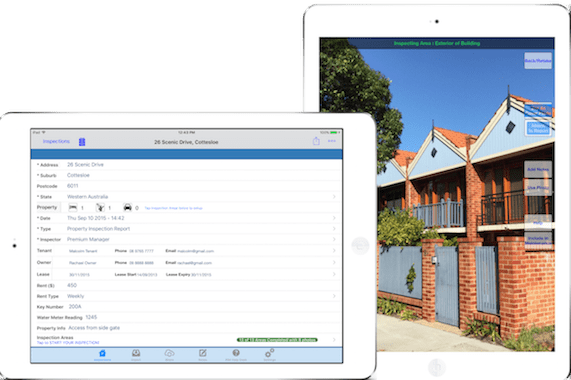 For PIM Pro Plus and PIM Premium download the free version from the App Store and upgrade by choosing the PIM Pro Plus or PIM Premium links above or call us on 1300 668 594 to upgrade. We accept payment via Direct Deposit (EFT) & Credit Card (via PayPal). Our bank details (including SWIFT Code for overseas payments) can be found on the bottom of each invoice. Please use your invoice# as the reference number. Are you ready to Transform your Property Inspections ? Talk to us today. We have extensive knowledge in the inspection industry and can advise on a better practice for your office. What's the latest in PIM ? 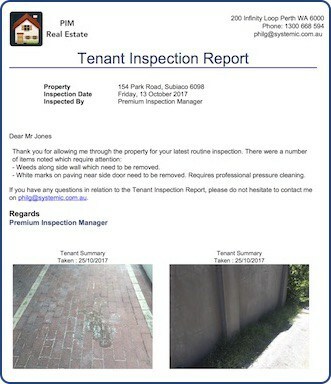 Property Inspection Manager site and software.© Systemic Pty Ltd. Who is PIM ?